Current reviews are below the form. 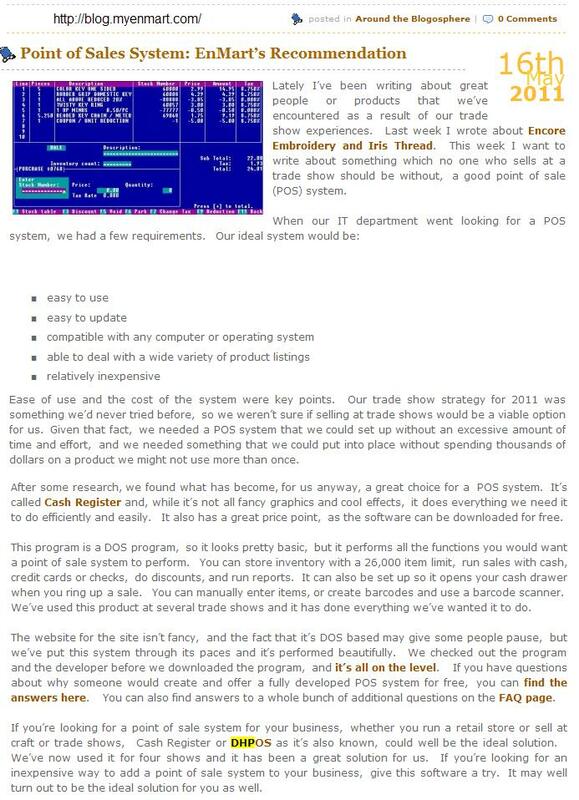 Many companies who wish to use this POS software cannot because it is free. Their upper management apparently believes that if it is free then either it is not any good or there is a catch. So I am asking for reviews. If you have been using this software for a period of time could you please fill in the form below. I am not asking you to make a recomendation for the program (but I won't stop you if you wish to) but only to state that for you it has worked well. At least I hope that it has. While I welcome any review, the most useful to prospective users will be from companies that are using this on a daily basis in a commercial environment. But help from anyone will be appreciated. Add your review. Using program since Optional . .
All reviews below are how well the person making the reviews believes this POS program is suitable for their particular application and is not to be considered as a recomendation for any other application. So I have an antique dad who's been snapping at me to get a replacement POS. He's rather like Dale in that he doesn't like new technology much. My old POS broke which was something from the 80s museum. All it did was print the price, date and total amount and that's how my dad liked it. I have tried some others where you have to press the buttons on screen and the price would come up but again my relic started shouting at me as the touchscreen would act funny sometimes and refuse to accept the button press. Then I came across Dale's DHPOS thru google and also thru reading a website which recommended Dale POS and just to visit his site for a laugh. I did visit the site and was impressed with the quality so I downloaded and tried it out for myself. I was messing with program but when my dad saw it he said we are having that as the till. I told him I was having problems with the printing but he said he didn't care how I sorted it but that's the program he wanted. Me being the mindless person that I am started fiddling with the software so I could get the printing right for my Chinese Xprinter. I had given up when i went to Dale's site and he basically corrected everything I had done wrong thru email replies and gave me solutions to my problems quickly. The software has been running as it should be and my old man's happy and I'm happy with the software and a simple solution to my problem. I'm still messing about with the software on another computer as I know I'll get Dale support if I need it. Thanks to Dale for a great piece of software and the actual after support that he's providing. I am a very happy user and can't recommend this enough. Also love the Facebook page of his that has funny and interesting stories of the DHPOS amongst other things. Keep up the good work. Contact name Eddie Email address . We discovered Keyhut POS in early 2017 while searching for a cost-effective yet powerful and easy-to-use sales system for a rural cooperative general store startup. After comparing several available offerings, we settled on Keyhut. You can't get more cost-effective than free and the feature set was...well...mind boggling. We found everything we needed and a lot of things that certainly came in handy. Can you say, "Feature-packed" boys'n'girls? Now, you might be forgiven for thinking that free is great...until it comes to a problem. That's where they get you; free product, expensive support (if any at all). We had very few problems implementing this software and when we did, the developer went above and beyond...for free! That's the developer...not a call center and not dozens of emails! Dale hangs out in his chat room every night just in case someone needs help. He was polite, helpful and funny (c'mon, have you READ the website?). In the end, even Dale couldn't fix government bureaucracy (kudos for trying, though) but he did manage to come up with a workaround that achieved what we needed. Keyhut is fantastic software. If you need an easy-to-use, easy-to-setup, powerful, feature-packed point-of-sale system, you've found it! This is it! Stop looking; go download it! If you need help getting it up and running, Dale is ready and willing to help. You won't find a better product or better support or a better price. What are you waiting for...? I found a nice review on the internet that is too lagre to reproduce here so I am just going to post the link. Predictive Analytics Today. DH's POS software is a simple yet complete, low requirement, versatile, easy to use POS software that stands firm between numerous paid solutions. I just started using it in my small Toko-at-home. For me as the store admin it does just about 99.5% of what I want, how I want and the way I can set it up makes it 100% foolproof to use for any unexperienced hired help. It keeps track of my sales, stock and profits but is by far not limited to that for those needing more functionality. Initially I read a little of the documentation and counted myself as one of the few intelligent users who actually did that. I was wrong and still asked Dale questions about things already explained and discussed on his site and forum. Still Dale didn't give me the RTFM and patiently listened to my questions and tried to help me with every silly thing I asked, almost instantly. His tech-support trumps any (paid) support I encountered elsewhere in my life. Many reviewers claim the best portion of his software is that it's FREE, however I disagree. It is totally awesome and amazing that it's free, but for me the best part it does about anything most paid solutions do, and more often than that it does it better and faster too. You don't even need to invest in any high tech equipment which makes it especially excellent for starting businesses and use in low-economy and developing countries. On top of that, his supporting documentation makes setting up such a boring thing as a cash-register actually fun. The absolute hardest thing for me is getting him to accept a donation since the ways offered are somewhat limited in certain situations. In early 2016 my father, the business owner, approached me with two software options for our store front. He told me, "I have one very DOS-ey looking one and one very modern looking one. You probably won't like the first one (DHPOS) because of its looks, but nonetheless I still want you to look at both of them and tell me your thoughts. And that's exactly what I did. The minute I got DHPOS up and running I instantly fell in love with it. It may look old school and basic, but don't let that deter you. Dale has obviously put a large amount of thought and effort into this program and it shows. You can do anything from sell theater tickets with a neat looking seating chart, to use this for your kids lemonade stand. Barcode scanners, receipt printers, cash drawers, even soundscan have been integrated into this software! My personal favorite, although not programmed by Mr. Harris himself, is the Layaway software. A smooth program built so that you can provide a Lay-A-Way program for your customers. This is great for my families shop. Being part gun store we offer firearms that customers can't always afford on the spot. So, with the Layaway software we can set them up with a payment plan that benefits both parties. I hope this review helps any prospective users on their decision making process. Oh and I didn't mention it earlier, but I took one glance at the other software my father presented me and as you can tell it didn't hit the mark. Keyhut�s Cash Register software is the brainchild of the inimitable Dale Harris, who is the internet�s greatest grouch. His site is worth looking at even if you never need POS simply for a good laugh. He is unapologetically himself and he is hilarious. 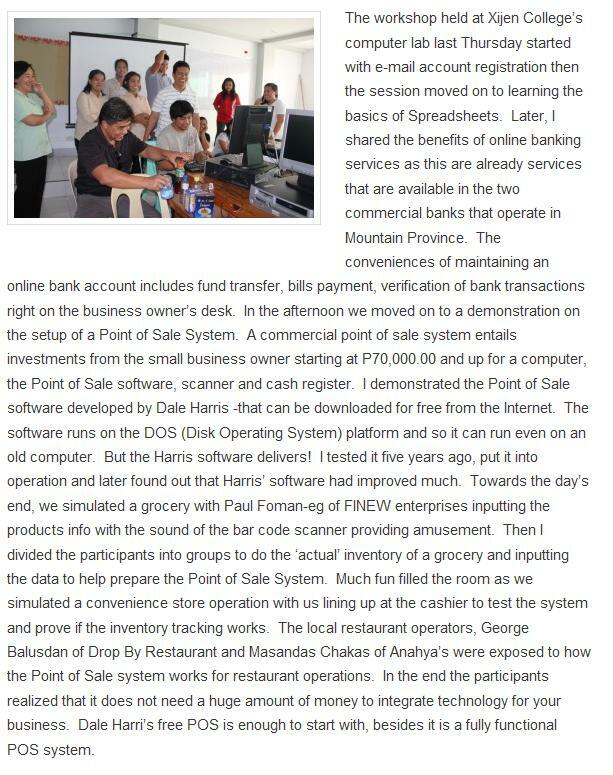 Cash Register is a completely free POS system because, as Dale puts it, coding is his hobby and he might as well do something with it. He designed this system for small businesses. It works with any cash register/printer/computer combo you might have, and he�s considering expanding the coding to include tablets. For extremely small businesses, the software can be run off your home computer provided you don�t mind receipts being printed on regular sheets of paper. This system, despite being free, can actually hold its own among paid POS systems aimed at small business. It can run multiple types of reports � including breaking the sales down by employee. It has some basic employee management, CRM, and inventory tracking features. It supports multiple registers. As well, Dale offers better customer service than some paid versions I could name. He responds very promptly to his email, runs an open forum, and is available via chat and phone from 8-10pm every weeknight to work any and all problems out. There are no official reviews out there of this system, but of the links Dale has posted to his website and two reviews I managed to dig up out of forums, users like Dale�s brusque, but easy-to-use approach, while finding both his website and interface hideous. Personally, I find his website charming and from the screenshots, I find his interface to be identical to ones used in many grocery stores � so, not that bad. Which is all Dale was going for, he�d likely remind you. I love the simplicity of this program. I use the inventory portion extensively. I have a computer set up at my work bench and as I use materials I enter it into the POS program. All I have to do is run my PO's at the end of every week and I order exactly what I need! Really great piece of software! I have been using your POS software for about 1 and a half years now, and I must say it is great. I�m really glad there is someone out there who is willing to take the time to take time out of their schedule and create wonderful free software. Your programs are some of the very scarce fully functional free software out there that doesn�t require paid registration, which really makes a difference when starting a small business or just playing around with the software. I will continue to use your software for as long as you develop it! Here is a review I found in a blog. I have reproduced it here as a graphic because the blog may age off. I am all excited! DHPOS goes LIVE in our restaurant! A big Thank you note to Dale for this great software and his quick support in resolving my issue(s) And the forum was really helpful which gave me lot of info. I had evaluated 2-3 products and DHPOS was my winner. It is simple and easy to use and quick to learn. I trained my manager who is a non-computer user and within an hour, he is comfortable using it. We often hear : "DOS-based POS application? We don't need it, 'cause we prefer GUI-based one!" But for some wise clients : "We don't care how it'll be, 'cause all we need is its final result. And make sure that it works fine!" I've been playing and experimenting with DHPOS since 2003, but I've recently (well, within the past 2 years), had a chance to actually put in a retail environment. It's be really great, as it's a small business and so doesn't have much spare cash, and DHPOS has performed well, even out-performing some other pricey applications! I'm proud to be using it in the store, as now I've had a fair few years playing with it, I know what to do with what. And as it runs on DOS, It costs even less to put into practice. My wife and I would like to sincerely thank you for your ongoing help. My husband had been playing around with this software for a while, trying to convince me to use it as my sales and stock control system. I eventually gave in, then he bought me a laptop to run the software on, a receipt printer, the Pertelian display and a barcode scanner. Although your software looked complex at first, it didnt take me long to get my head round it, and now its really simple to use, extremely robust, and packed with options to cover most retailers needs. You are an absolute gem. Thanks Dale. Its made my job a whole lot easier, and given my small business that little extra edge. A memeber of the staff broke the supervisor key in the cash register lock! I was going to replace the register but then i found this software. I had spare computers in the back store room and pulled them out and they went like a dream. Its great to understand and within 45 minutes it was going like a dream! Thanks Dale its the best software around please do make more! When I took over running the retail and sales for Carreira Farms earlier this year, I knew I had to find some form of Point of Sale software which was flexible enough to keep track of sales for a multitude of vendors, but be easy enough for anyone to use. I have used various POS software before, in a number of different environments. I only wish they had all been this one!! The software is intuitive, easy to set up and easier to use than any other I have worked on. It is remarkably complex in what it CAN do - but you don't have to use everything! My daughters, aged 8 and 10, picked up how to use the software within an hour, as did my store clerk who is in her late 60's... Its accessible and easy to use for any age! I just want to say that when I first installed your POS a year ago I was skeptical being a DOS application and QBasic derived and all. However, one year later and not a single crash! Its very very robust application and it does the job! Its an amazing achievement and would be a good project for recycling old P1 pc's. Again, thanks for the application, I tell everyone about it. I�m the assistant manager at a Quizno�s Subs. Last month I downloaded your software to experiment with. I was planning to use it for delivery order taking, but I was never really convinced about using it. Well, today our POS terminal broke down (we are required to use a terminal provided by Quizno�s Corporate), and it�s not going to be possible to fix it until tomorrow. This could have been disastrous. We would have had to close the store for the day. However, I remembered your software and I still had it loaded to my delivery computer. After a half-hour of configuration, we were ready to open. It really saved the day. The software worked perfectly, and the employees loved it (it was easier for them to learn to use it, than the Quizno�s POS). Though I�m required to go back to using the Quizno�s POS, I plan on keeping your software running for my delivery system. However, I am going to recommend your program to our �Franchise Leader� (he makes sure all the stores are running in good order) for people in similar situations.